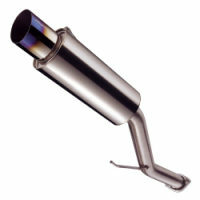 Upgrading the exhaust system on your vehicle not only improves the sound of your vehicle, but also the performance. Most factory exhaust systems are very restrictive, robbing you of power in order to keep the vehicle emissions low and the ride extra quiet. With the exhaust systems and hi flow catalytic converters here at New Level Motorsports, you�ll find yourself experiencing all sorts of power. We have the Corsa, DC Sports, Gibson, Injen and Pacesetter exhaust systems you�re looking for. When you look through our selection of performance exhaust systems and catalytic converters, you are sure to find the right solution for your vehicle. Whether you're looking to upgrade to dual exhaust, black tips, all stainless, or just looking for maximum power, we've got you covered.